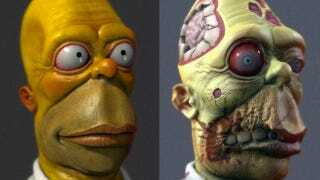 You know we're suckers for real life portrayals of any fictional cartoon — but real life zombie Homer Simpson is twice the amazing. It's two great tastes that taste great together, people. Created by Deviant Art's TranzorZ3D, behold Zombie Homer, who probably has waaaay too big of a brain! And we threw in the artist's original Homer Simpson, just for comparisons sake.